Recently, the City of Paris gave out medals to the most prolific users of Vélib’ since the system began on July 15, 2007. The “gold medal” was awarded to William, a 40 year old with 3,813 trips. Peter, another 40 year old with 3,774 trips of pedaling, won the silver medal and Thierry, the youngster at 29, snagged the bronze with 3,692 trips on Paris’ grey bikes. To achieve this quantity of trips, the medalists were using Vélib’ at least 5 times each day. These individuals exemplify the health benefits of bike-sharing and of cycling in general. The men are now in great physical shape. William lost 15 pounds pushing pedals in Paris. (Try to say that ten times fast. Their accomplishment also points to the healthiness of particular bike-sharing programs. A key factor in a healthy system is the number of usages of bikes per day. Paris, with the help of these guys, has usages 5 to 7 times a day. Lyon averages 7 times a day. Montréal within a few weeks of its launch had 3.5 usages a day. Barcelona tops all with an average of 10 usages per bike per day with spikes of 20 per day on beautiful beach days! It was announced in the Montréal Gazette and the Boston Globe this morning that Boston is to follow London in choosing the bIXI bike-sharing system for the Boston Metropolitan Area Planning Council bike-sharing program. The program’s plan is to begin with approximately 2,500 bikes in 290 stations then increasing to 5,000 bikes with around 475 stations through Boston, Cambridge, Brookline and Somerville, MA. As with London, the bIXI system in Boston is to begin around May 2010. An update on today's bi-city bIXI bonanza is online from bIXI. 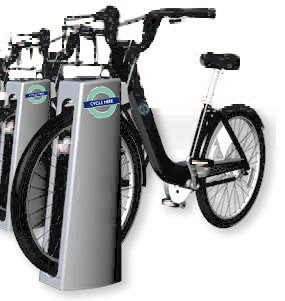 Today Transport for London (TfL) chose Serco to manage, service and bring to life London's Cycle Hire scheme and Serco has partnered with Montréal’s bIXI system to set up the 6,000 bicycle fleet with 400 docking stations. TfL expects to have the system quickly operational with the goal of May 2010. With the bIXI's drop in place docking stations, that should be easily obtainable. The bike hire scheme is part of London Mayor Boris Johnson’s £111 million bicycle improvements for the UK’s capital. The press release from TfL Cycle Hire quotes Mayor Johnson, "They (Serco and bIXI) can't wait to get cracking on helping us get thousands more Londoners on two wheels and I'm sure that the cycling revolution taking place in the Capital will rapidly become the envy of the world." Even with the easily installed bIXI stations and bikes, bike-sharing might not come as easily as it should, central London is composed of different “councils.” According to Global New Clickpress, the councils of Camden and Westminster have been slow to approve the placement of docking stations on the streets in their jurisdictions. The councils fear the lost automobile parking revenue from metered spaces. Undoubtedly these councils do not realize the idea is to reduce the amount of automobiles and the congestion in the streets! The Bike-sharing Blog commends London on its choice and looks forward to riding a London bIXI along the Thames. The annual suscription will cost 200 pesos (US$15) entitling the card holder, pictured here, to ½ hour of free usage. With Smartbike the Mexico City government is trying to reduce automobile congestion in the largest capital city in the world. When operational at the end of this year, it will be the second largest bike-sharing program in the Americas. 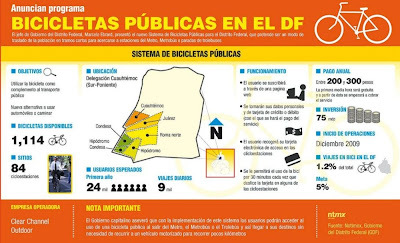 Update: August 14, 2009, Clear Channel Outdoor says the contract for the system in Mexico City allows for expansion up to 6,000 bikes in 400 stations. With at least 125 3rd generation bike-sharing programs around the world, we have accumulated much experience and data about bike-sharing and its impacts on cities and towns. Now wouldn’t it be great to have this data at your fingertips? Look no more, thanks to a project called “Optimizing Bike Sharing in European Cities” or OBIS of the Intelligent Energy - Europe program of the European Union. Looking through the data sets of bike-sharing programs in nine European countries - from Sweden to Italy and Spain to Poland, I’m pressed with all the data the project has collected so far. This data includes everything from administrative aspects of running a program and customer pricing to financing and results. While the spreadsheets are being provided presently, they are works in progress with OBIS continuing to fill out the expansive data sets for each of the countries. Already the data is invaluable in better understanding the positive impact bike-sharing has had on European communities and likely would have on communities around the world. During the Car-Free Sunday road closure in Golden Gate Park on John F. Kennedy Drive at Conservatory Drive East from 10 AM to 3:30 PM, MUNI (San Francisco Municipal Transit Authority), and City CarShare wants you to try out the BiXi, system of Bike-sharing. Enjoy “Summer Streets!” While Park Avenue is closed to motor vehicle traffic from 72nd Street to the Brooklyn Bridge on these three consecutive Saturdays 7 AM to 1 PM, there will be bike-sharing demonstrations of bicycles and automated docking stations from various international companies. These will include: B-cycle, BiXi, Eco Trips, NY400-Bike & Roll and Samba. The times and locations will be on the NYCDOT Summer Streets page. At the Discover Center in South Lake Union in Seattle on Tuesday, 10 AM to 6 PM, August the 11th come and compare the bikes from: B-cycle, The Bike Share Group and BiXi, If that isn’t enough, come over to Redmond Town Center on Wednesday, 12 PM to 8 PM, August the 12th and do it all over again. Spend a bike-sharing weekend in Portland on Friday August 14th at the Pavilion in Waterfront Park just under the Burnside Bridge and on Sunday August 16th at the Southeast Portland Sunday Parkways Event along the route between Colonel Summers and Mt. Tabor Parks. The reward will be an array of different bike-sharing companies: B-cycle, The Bike Share Group, BiXi, and Portland Bicycle Tours are all asking riders to give them a try. Schweers Technologies originally scheduled as a participant will not attend. August is a great month for travel and biking. So share you travel time, enjoy these events and learn more about bike-sharing!